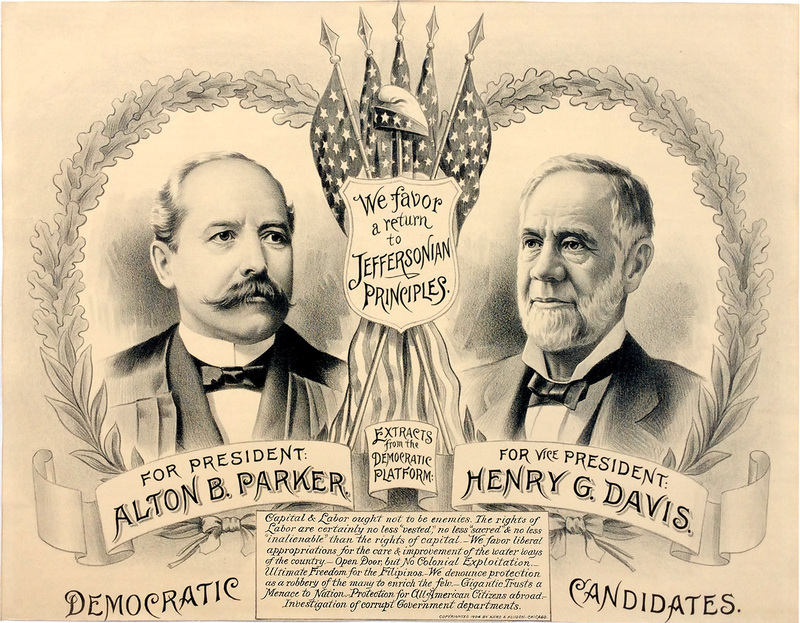 Poster promoting Alton Parker for president and Henry Davis for vice president, 1904. Lithograph. Kurz & Allison, Chicago. Trimmed to edges of artwork, otherwise essentially mint. Sold to previous owner in a June 2015 Cowan's auction for $3000 (American History Live Showroom Auction, Lot 212; copy of receipt will be included). 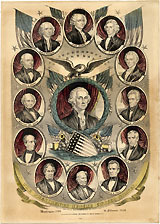 This would easily qualify as one of the most impressive early campaign posters we have handled, and possibly the best Parker-Davis poster in existence. While the trimmed margins are unfortunate, it is the only defect and one that could easily be concealed with professional matting and framing. We acquired the poster from the estate of the buyer, a major West Coast collector, and are thus able to offer it for significantly less than the price realized in the Cowan's sale. A unique opportunity for the political poster or Parker specialist.